It was a pleasure to meet you and Eleanor and Emma in Borrego Springs and we much enjoyed our chat. Great to be a part of such a fun, although informal, group. Likewise, a pleasure to meet you & Sue — and we hope to see you again! 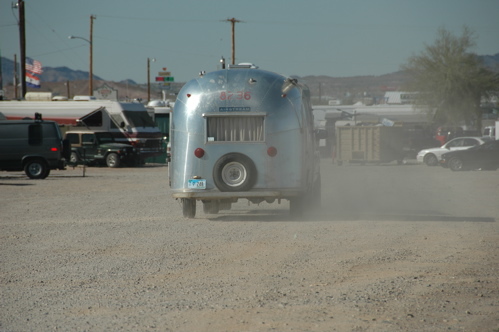 Airstreams have about an R-7 value from the pink fiberglass insulation in their walls. Some RVs have more, many RVs have less or none. The Airstreams with exposed aluminum interiors tend to feel a little chillier than those with covering, but all are insulated equally. 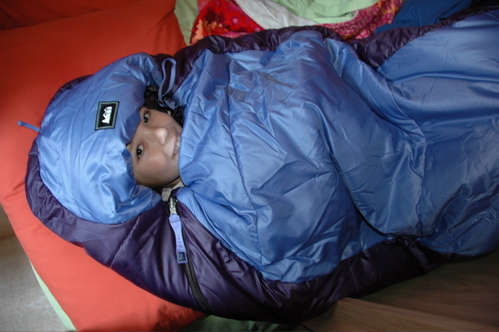 Emma looks very chic in her new sleeping bag! We would need way warmer ones here! We were at 9 degrees last night and more snow is on the way. We have about 13 in. standing in the backyard. Send us some sunshine! Hope Eleanor is on the mend. I am down with a cold too, which I caught at the nursing home. Larry is trying to duck it. Hi to all … Are digging the gem show? Call if you want to go bowling or let the kids rockhound together.